If you’re planning a family ski trip this winter, you’ll need to gear the family up! We have put together a list of the best kids ski goggles to help narrow down your choices when you’re looking to purchase ski gear for your family. Kids ski goggles are, for the most part, very affordable in comparison to their adult counterparts. You could spend $100s on adult goggles but kids goggles mostly come in under $50. Great for parents who have lots of kids to kit out! These helmet compatible ski goggles for kids are suitable for kids who want to ski or snowboard. They’re a little big and have interchangeable lenses so more suitable for older kids. For this reason we think they’re the best youth ski goggles. Moisture wicking foam will keep your child’s face dry during the day and the flexible fit and wide strap will keep them snug and secure on their face. The lenses are dual vented and antifog coated so won’t fog after low to moderate activity. 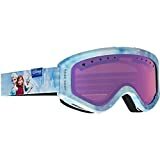 They’re available in six different colors to suit your ski gear including camo, orange, pink as well as black and white so they make for some of the best boys ski goggles but also work great for girls. Price: Find prices and read more reviews for the Oakley O2 XS Kids Goggles here. Want the best ski goggles for kids at a great price? Then check out these Giro youth ski goggles. Dual lens aided by the anti-fog coating resists fogging. A double layer of face foam prevents cold air from creeping in. These are helmet compatible so make for good youth snowboard goggles. A couple of different colors are available – black/white, blue/green and red/black. Prices: Find prices and read more reviews for the Giro Grade Kids Goggles here. These junior ski goggles from Bolle are bangin’! The strap prints and lens colors are really cool. And even better, they’re pretty inexpensive. An anti-fog layer on the inside of the lenses and venting system will keep them clear while you’re kids are moving. Scratch resistant protective armour on the outer lens is fab for clumsy kids. The double lens provides a thermal barrier to keep kids’ eyes from feeling the cold. They’re helmet compatible too. Price: Check prices for the Bolle AMP Goggles here. This pair by Anon are some of the best kids ski goggles suitable for junior skiers and snowboarders. Helmet compatibility makes them a safe choice and full perimeter channel ventilation means they won’t fog easily. Dual layer face foam provides a warm, snug fit on small faces. The five different colours available this season are mostly boy-ish but if you look hard you might be able to find a pair of the limited edition Frozen branded girls snow goggles which I think are last year’s version but still super cute. They have them here on Amazon along with a matching Frozen helmet here! Price: Find prices for the Anon Tracker Kids Goggles and read more reviews here. These Smith kids’ goggles are great value. With cylindrical dual thermal lenses and antifog treatment you kids will be good to go. And they’ll look snazzy too. They come in a range of prints and colors including Angry Birds but girls’ are really in luck with the range of colors and strap art with this brand. They’re helmet compatible so they’re great childrens’ goggles for skiing and snowboarding alike. The face foam that rims these kids ski glasses is hypoallergenic so fantastic for kids with sensitive skin. For tots who want to shred, you need small goggles to fit their little faces. With these kids’ goggles ski and snowboarding toddlers can keep up with the big kids! The Giro Chico come in a range of strap colors so they’re suitable for use as boys snow goggles or for girls. They’re helmet compatible too. These kids’ snow goggles have an antifog coating and vented lenses to prevent fogging up. The tailored face foam is lined with microface to prevent cold creeping in and give these snow goggles for kids a good fit. Price: Check prices on the Giro Chico here. Baby ski goggles are a bit hard to find. If you’ve got a really small child and you can’t find any baby snow goggles that fit then just use baby sunglasses like this. If you’re looking for the best toddler ski goggles, then check out these Spy Targa Mini. It can be really hard to find toddler ski goggles but these pair do the trick! Reuben had them at age 4 and 5 years for snowboarding in Park City and they worked out great for him. We used them for Hazel who was 18 months at the time too so they also work great as the best baby ski goggles. The flex frame design hugs the smallest of faces to keep them warm and 100% UV protection to keep little eyes safe. There are lots of cool prints and colors available so they suit both boys and girls. Price: Check prices for Spy Targa Mini Kids Goggles and read more reviews here. Hope you’ve liked our list of the best snow goggles kids need these winter! Let me know if you have any questions or comments.